To receive, exchange, give away and keep gifts. Play a game involving gifts that are constantly changing owners by rolling the dice and using the 107 timeless task cards. You can choose how long the game lasts. Once the time is up, the gifts that you have at that moment are all yours! At least 3 gifts per player, 1 set of task cards, 1 task card bag, 1 dice. All gifts should be wrapped! Put all the wrapped gifts together and roll the dice. Any player who rolls a 1 or a 6 may choose a gift and unwrap it straightaway. Continue until all the gifts have been unwrapped. 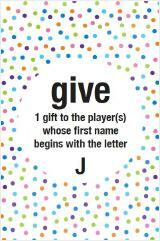 Note: All players should finish the 1st round with at least 1 gift. Did you not roll a 1 or a 6? Never mind, the last gift is for you! Remove all the ABC cards from the game that do not have the letters of the players’ first names. 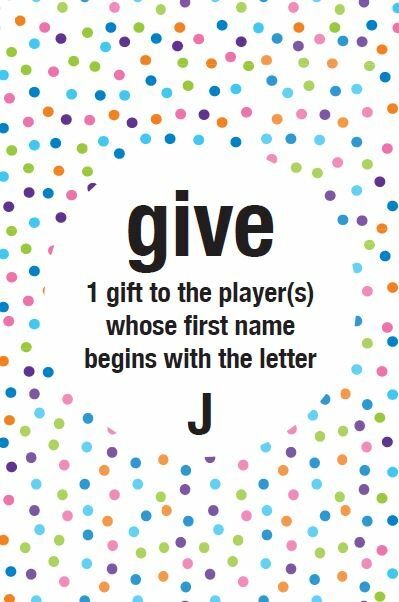 For instance, if you are playing with Frank, Diana, Jack and Yvonne, leave the cards with the letters F, D, J and Y in the game. You will not need the other ABC cards for now (for this group of players). Shuffle the cards well before using. Set an alarm clock and hide it away somewhere. You can choose how long the game lasts. The longer the game lasts, the more fun it is! You can also play this final round in various stages. For instance, play for 30 minutes, take a break for 30 minutes and then play for another 30 minutes. Put the cards in the task card bag and pass this around with the dice. If you roll a 1 or a 6, you can take a card and carry out the task. Take a new card if the task does not apply to you. Put away all the old cards (do not put them back in the bag)! • Everyone keeps at least 1 gift, whatever the task. • When the alarm goes off, all the gifts you have at that moment are yours. • Let your hair down!